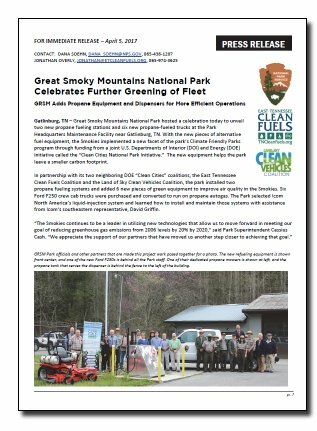 We are very proud to be helping the Great Smoky Mountains National Park move forward toward their 2020 goal of 20% reduction in greenhouse gas emissions from 2006 levels. The new propane equipment will help them achieve this goal. For more information about the U.S. Department of Energy Clean Cities National Parks Initiative, please visit the national CCNPI website. Tennessee Clean Fuels (TNCleanFuels), comprised of two non-profit organizations, works across the state of TN to reduce petroleum use and subsequent air pollution and emissions. Since 2005, TNCleanFuels and its many partner fleets have collaborated to reduce the use of over 49 million gasoline gallon equivalents, and, since 2009, have prevented over 219,000 tons of greenhouse gas emissions from being generated in the state.